Description: 3D Print Toolbox is a set of tools that help you to prepare models for 3D printing. These tools include graphical visualization, geometry transformations, creation of control programs. The program allows you to place your models in the workspace of 3D printer and cut 3D image into the layers. Description: Allows character based apps (DOS-Windows-Unix-Linux) to print to ANY Windows printer, including USB, network printers, faxmodems and PDF writers. It can capture LPT ports and redirect the jobs, even if a printer is phisically connected to the port. It also allows you to preview printing, include logos and other images, send the jobs via fax/e-mail, use specialist fonts (barcodes etc. ), colorize the text, export in PDF, archive copies and more. Description: Print from DOS, Unix, Linux to Windows printers: USB, GDI, PDF, e-mail, network, fax, IP. Capture PRN: , LPT1:-LPT9: & COM1:-COM9: and redirect the print jobs, even to a printer phisically connected to the captured port. It also allows preview printing, include logos and background img, send the jobs via fax/e-mail, use specialist fonts (like barcodes), colorize the text, export in PDF, archive copies, same job to multiple printers and more. Description: Active Printer is a small but mighty printer utility from Palick Soft. The idea behind this ingenious tool is brilliantly simple - after installation, Active Printer icon appears in your system tray and lets you choose your active printer (the printer you are about to use) with just one mouse click. No need to browse through countless options, change settings, then change them back. If you have several printers in your office, get this tool. Description: Do you have hundreds of fonts on your computer? Ever tried to find that one particular font you needed but you don't remember the font name? Instead of searching and scrolling through dozens or hundreds of fonts names, you can now view all of your fonts right on the screen. Description: Batch & Print Enterprise is for batch printing documents from a retainable list which can be automatically printed in document sequence of your choice, All associated shell printable documents are supported, e.g. PDF, MS Word, HTML, Text Files, Image formats, Excel Spreadsheets, PowerPoint Presentations and many more. The Enterprise version features multi core, multi-threaded processing and multi-threaded printing for printing large scale. Description: Batch & Print Premium Law Edition is for batching documents as retainable lists which can be automatically printed in document sequence of your choice or can process and print multiple prints at the same time, this law version has been pre-configured for batch printing in sequence all files including email files MSG, EML, PST Archive files with attachments & supports emails within emails. 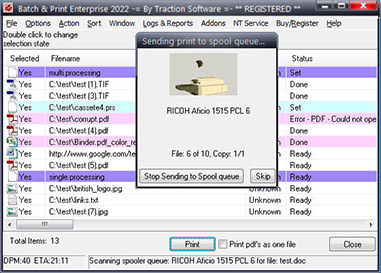 Description: The batch printer can execute the different format files at one go and take the printouts quickly. This tool is specially designed for those people who have no time to change the file format due to heavy workload and need prints on a regular basis. Not even only normal word documents can take out of this, users can take print outs of image files as well in different extensions such as - jpg, png, gif and much more.